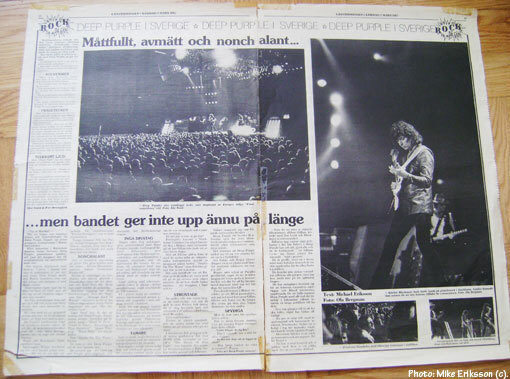 Here is an old article on Deep Purple´s visit in Sweden in early 1987, printed in local newspaper LT here in Jämtland county back in the day. I travelled to see the band in Malmö (February 25) and Stockholm (February 27), stayed at their hotel in Malmö, accidentally travelled with them on the same flight between these cities etc. I did the trip with my old friend (photographer) Michael Johansson, although the images that were later used in this particular article came from Ola Bergman (another journalist I knew well back then). The press thing was awful, I could tell that some journalists were quite negative. I remember throwing in a few questions that I already knew the answers for just to give the band a chance to come out of it OK. They did get some positive press that way, especially regarding the matter of South Africa. One journalist asked Ian Gillan why he had cut his hair and he said “Because it kept falling into my beer”. One asked Ian Paice if they should´t quit soon due to their age and he said “How long are you going to be a journalist?”. I used to hate these big press things. Ritchie Blackmore and Jon Lord never showed up. Interestingly, nobody in the Purple organisation knew were Blackmore was until an hour before the show in Malmö. He had done a Stateside trip home in between gigs without telling anybody (I recall people saying “Have you seen Ritchie?” etc). The flight to Stockholm was interesting. They travelled in a regular SAS plane and I doubt that too many people realised they had a legendary band sitting among them. Then the pilot decided to welcome Deep Purple to Sweden over the speakers and I suppose you can guess what happened next. I wish I had all this on film but it was before the tiny digital cameras that one carries around these days. Classic stuff. Then there were Stockholm and Blackmore walked onstage in the ugliest green leather jacket imaginable. Michael Johansson got a session with Ritchie and the entire band as well (if memory serves me right). I recall us leaving the arena with members of 220 Volt in a limo. The unforgivable act of not playing “Smoke On The Water” by The Man In Green was repeated in 1991 in the same city, but this time in Stockholm the rest of the band performed the final songs without the guy. Looking back, the cracks were showing and it was just the second tour of the reunion. You could argue that the guitarist did not care much anymore and I think that is true. Gillan was fired after the last shows for “The House of Blue Light” some time later and Ritchie seems to have favored the lineup that followed with Joe Lynn Turner fronting the band. 1987 was an interesting year in the bands history. The new album was regarded as a fairly weak follow up to “Perfect Strangers” and the loss of credibility in an era that now had a new school of bands stealing much of the thunder did not serve them well. The gig I saw in Malmö was the best I had seen (with the band) at that point though, so they had that strength still. That same year, ex-Purple singer David Coverdale conquered the world with the “1987” album, and had far greater success than his old band. This version of Deep Purple reunited in 1992 and we did get a good album and a great tour of Europe in 1993, but that was it. I think they have done well without Blackmore considering his status, far better than anybody would have expected. That dangerous twist was something to behold though, no doubt about it.